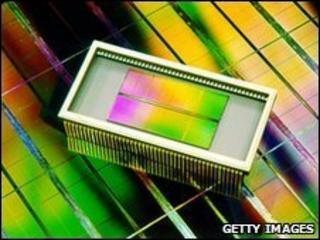 Nine chip makers have been fined 331m euros (£283.1m, $404.2m) by European Union regulators for illegally fixing prices. The companies involved are Samsung, Hynix, Infineon, NEC, Hitachi, Mitsubishi, Toshiba, Elpida and Nanya. A 10th chip maker, Micron, was also part of the price-fixing cartel but escaped a fine in return for alerting the competition authorities. The chips - DRAMS - are used in popular items such as personal computers. Samsung received the biggest single fine of 146m euros. The second biggest was 57m euros, which was levied on Germany's Infineon. All the fines were reduced by 10% because the companies co-operated with the probe. The cartel, in operation between 1998 and 2002, involved a "network of contacts" who shared secret information. They colluded to set prices for DRAM chips sold to major PC makers and server manufacturers, the commission said. The penalties mark the first settlement decision in a cartel case in which companies received a 10% cut in penalties in return for admitting involvement. The investigation began in 2002, when Micron blew the whistle on the cartel. The EU's Competition Commissioner, Joaquin Almunia, said: "By acknowledging their participation in a cartel the companies have allowed the Commission to bring this long-running investigation to a close and to free up resources to investigate other suspected cartels." He added that future cases should be concluded more speedily. "As the procedure is applied to new cases it is expected to speed up investigations significantly." All but one of the companies, Germany's Infineon, are non-EU businesses. The EU's anti-trust regulator said they were all penalised because they sell their products in the European Economic Area and were therefore subject to EU law, which bans practises that restrict competition.